Changing attitudes to Islam profoundly influence political cultures and national identities, as well as policies regarding immigration, security and multiculturalism. Given that the majority of relevant scholarly works have either adopted monocultural perspectives, or approached Islam in its general, non nation-specific dimension, the need for in-depth, multi-nation studies is urgent. Islam itself, and responses to its rise, are becoming increasingly internationalised. It is therefore important that analyses of Islam-related phenomena are sensitive to the particular cultures in which they are encountered. This volume does precisely that. Contributions, some explicitly comparative, others implicitly so, cover perspectives from across Europe, the USA and the Middle East, along with new treatments of the rich diversity to be found in Islamic art, and discussions of inter-faith exchanges. They also represent a range of disciplinary approaches. Among the many issues addressed are: the challenges posed by the rise of Muslim radicalism to multicultural societies; various media treatments of the War on Terror ; the national specificities of Islamophobic xenophobia; contemporary visual arts in Islamic societies; differing attitudes to the translation of religious texts. The authors include authoritative, international experts, balanced by promising, younger scholars. Chapter authored:The Burden of Representation: Contemporary Visual Arts in the Middle East. 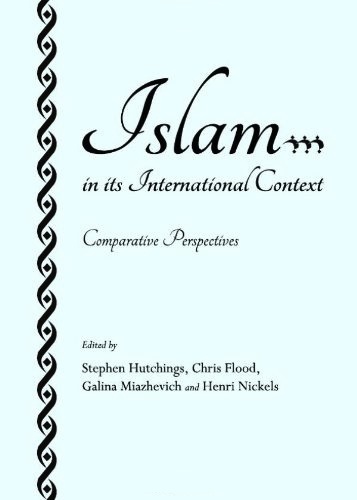 To purchase a copy of Islam in its International Context: Comparative Perspectives please follow this link.